A rare gunfight in Seoul on Wednesday night has caused concern among the public, revealing a loophole in the country’s strict gun control policy: homemade guns. Public criticism and worries are mounting over the authority’s lax control over privately manufactured weapons, after a police officer was shot dead in what appears to be a premeditated attack using a self-made gun. The policeman was shot in the back by a criminal suspect, who was armed with homemade guns and was wearing a bulletproof vest and helmet, in northern Seoul at 6:30 p.m. Wednesday, according to the police Thursday. When the 45-year-old suspect, Seong Byung-dae, was apprehended, he was carrying six wooden guns, made with iron pipes attached to 30-centimeter-long wooden sticks, the police said. They later found 17 homemade guns, seven knives, a hammer and a homemade explosive device at the crime scene. A nine-time convict with a record of sexual assault and violence, Seong seemed to have carefully planned the attack, police said. They suspect he learned methods to make the weapons from the internet. The attacker seemed to hold a grudge against police, having made several posts via social media that signaled a future attack. In the latest update, he uploaded a video on Sept. 11 showing directions from Gangbuk Police Station in Seoul to Opaesan Tunnel, where the fatal shooting took place Wednesday. He had written that he would “smash” police in two or three days. Seong has served a total of nine years and six months in prison and was last released in 2012. The victim - police officer Kim Chang-ho - was dispatched to the scene after a report came in that a passerby was injured by the suspect. Many Koreans, who had believed the country to be at least free of gun crime, are shocked that detailed guides explaining how to make weapons at home are easily available online. In South Korea, only government-authorized personnel are allowed to carry guns. It also bans the act of uploading manufacturing methods for homemade guns or explosives on the internet, and doing so is punishable by up to two years in prison and a fine of 5 million won ($4, 400). The law has been in force since January. However, with authorities’ low level of supervision and lax restriction on the age of viewership regarding online videos and blog posts, experts say it is difficult for police to crack down on the manufacturing of homemade weapons. “Since people have easy access to online content that explains how to make homemade guns and explosives, it is difficult for police to keep an eye on controlling homemade weapons, ” said Gwak Dae-kyung, professor of police administration at Dongguk University. “Considering that those videos and blog posts spread quickly online, constant monitoring of those contents will be the only way to control and prevent such crimes, ” he added. Prevalent methods of manufacturing homemade weapons available online has not only led to lax control over weapons, but also allowed individuals to retrofit the crafted guns for stronger firepower. Korea has seen several cases involving homemade guns over the past decade. 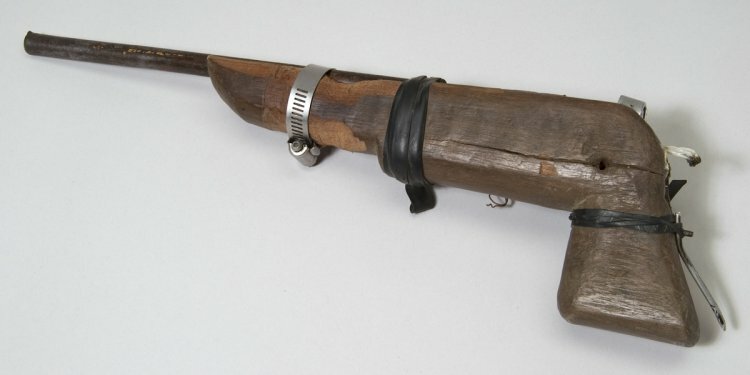 In 2007, a 47-year-old man in South Chungcheong Province opened fire in a park after he had manufactured a gun with iron pipes and wooden sticks that he collected from a nearby construction site. In 2010, a 19-year-old high school student was caught testing out handmade guns and sharing methods to manufacture them on an online community. The student allegedly told police he gathered information from overseas websites and an encyclopedia, which helped him create a specially adapted gun with firepower three times stronger than a normal K2 rifle.